We provide on-site trash dumpsters, including delivery and pick up for your home or business remodeling job. Our conveniently sized containers were designed to take up no more room than a parked car so we are not in the way of your neighbors or other businesses. If you need to clean out your attic or garage we have the perfect solution to getting rid of your trash. We deliver a dumpster to your home, you fill it up and when you’re finished we pick it up and get rid of your trash. 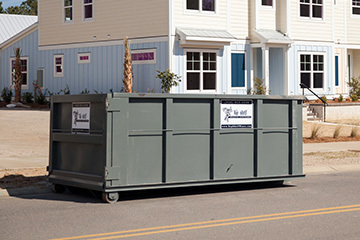 If you’re remodeling your business, our dumpsters conveniently fit in a single parking spot so we are not in the way of your existing business. We will pick it up within 24 hours, guaranteed. 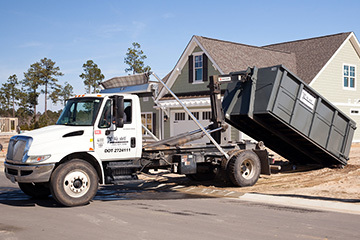 Our trucks and dumpster are well serviced and maintained so there is no need to worry about leaks on asphalt or driveways. We service Brunswick, New Hanover, Pender, Onslow Counties in North Carolina and Horry County in South Carolina and surrounding areas.